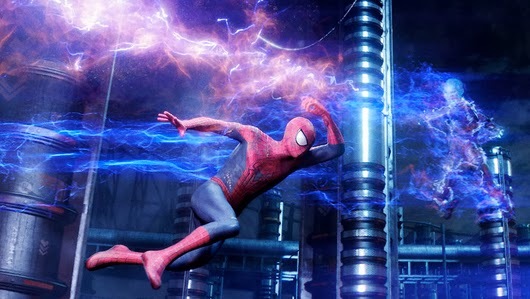 Below is Sony's official write-up for the plot for "The Amazing Spider-Man 2" ("Rise of Electro")? We’ve always known that Spider-Man’s most important battle has been within himself: the struggle between the ordinary obligations of Peter Parker and the extraordinary responsibilities of Spider-Man. 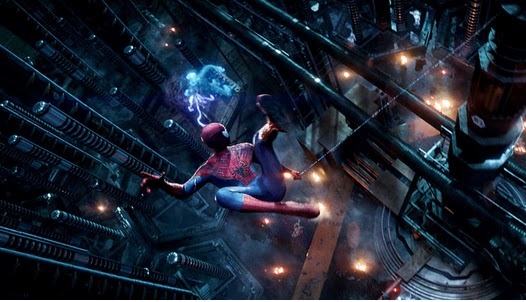 But in The Amazing Spider-Man 2, Peter Parker finds that a greater conflict lies ahead. It’s great to be Spider-Man (Andrew Garfield). Directed by: Marc Webb from a screenplay written by Alex Kurtzman, Roberto Orci, and Jeff Pinkner. Starring: Andrew Garfield, Emma Stone, Jamie Foxx, Dane DeHaan, Campbell Scott, Embeth Davidtz, Colm Feore, Paul Giamatti, and Sally Field. The new trailer hit online today and will play in front of the new "Hobbit" film next week. Much excitement surrounds this film, mostly in part of it having a lot to prove after largely mixed reviews of part one. A recent triptych poster revealed an unexpected Green Goblin stand-off and recent casting lists now foreshadow the return of Peter's parents (most likely in flashbacks). 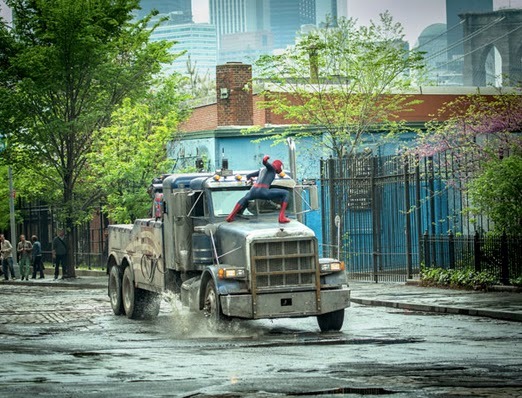 Below are recent images from the movie, showing Spidey in action vs. Electro and pre-costume Rhino (he's driving that truck). Why does he look so shocked?....oh...right. Video game or movie footage? You decide. It appears this movie may have some pretty standard action sequences but what's really got the internet talking is the build-up to part 3. Rumors abound that Venom will make a return, as well as a full-fledged Green Goblin story. Personally, I'm most impressed with the Spidey costume re-design, very "ultimate" and sleek. 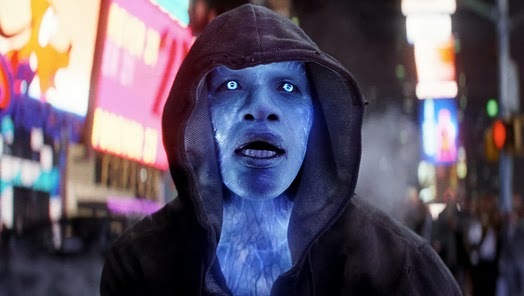 The white eyes make a huge difference and if they make Peter a little less of a jerk in this one, the movie might give this rebooted franchise the legs it needs to keep going.